Box mods are all the rage lately, but we spotted this ultra cool 18650 mechanical tube mod that we thought was worth sharing. Reminiscent of the AR Mod with it’s hollowed out body design, the Homai Spider Mod is a bit more refined with its cross-hatch pattern. Not only will it look great with a colored 18650 battery peeking through, but the holes will keep the battery cool and allow it to vent. 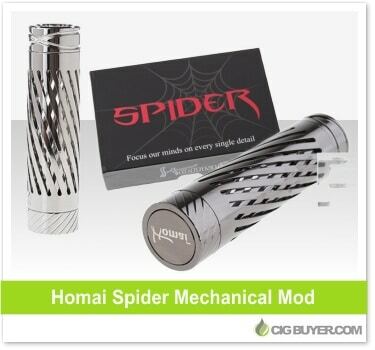 Made of chromed brass, the Homai Spider Mod comes in silver or black and includes a fixed 510 and spring-loaded bottom firing button.